JUNE 20, 7-8:00PM ON THE DUNEDIN CAUSEWAY BEACH LEFTSIDE OF BOAT RENTALS. 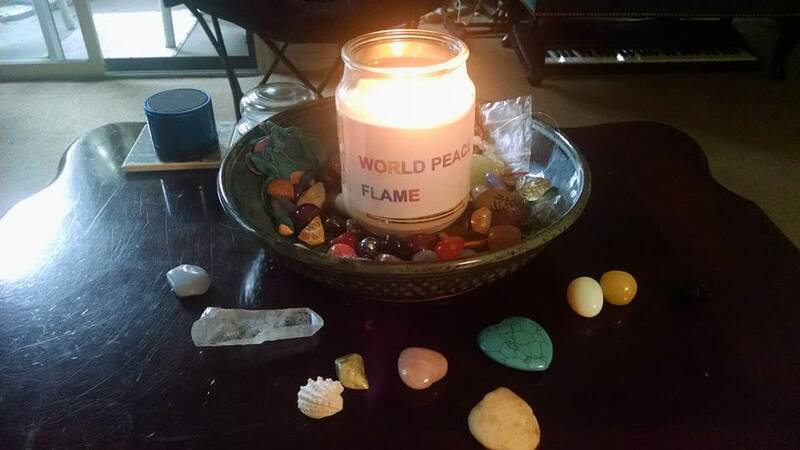 JOIN US AS WE LIGHT THE WORLD PEACE FLAME AND JOIN WITH A THOUSAND DRUMS AROUND THE WORLD. DRUMMING THE HEARTBEAT OF MOTHER EARTH, CEREMONY, MEDITATION - IMAGINE PEACE. Change is the basic principle of life. Today we use change to perceive our path and open to the power of Vision in the East direction. All healing results when we link to the whole, and balance all worlds within worlds. The Medicine Wheel is a path for wholeness and healing. The void, or circle creates sacred space for the divine origin of the new. Let us join all energies as one. These are our times and responsibilities, we are here today, not by accident, but by Divine calling. Today we face challenges, we have come here to intend for the Awakening of Humankind, and to Create Sacred Space for giving birth to a new world. When we support Life, Unity, Equality for Eternity, we give birth to Heaven on Earth. As we listen to the sound of the Drumbeat, let our hearts be one with the thousand drums around the world, and transform this present darkness to a new world of love, light and peace for all. As we look to the direction of the South, we call in the power of the south energies; the circle of the plants, and the power to walk in innocence, faith, and the true spirit of Unity. The power of the South gives us the strength for wellbeing and emotional harmony. Let us purify our hearts in the Fire of the Sun and rekindle the true spirit of unconditional love for all. Now facing the West direction, we call on the power of the West direction, the power of the Earth. Let us review our past as human beings and ask, what have we learned? Look within yourself for the answer. The within direction is the place where we unity with spirit and with power to direct our energy to create a bright new future for all. We ask forgiveness for our errors and for all beings. Now release the past. Looking to the North direction and the circle of the ancestors, and the circle of the animals, today we unite with the power of wisdom. As we choose to release the old “form” that does not serve the highest good for the whole. We call on Wisdom and Light to shine on our path as we surrender the things that cause division and separation and enter the unknown mystery held , deep in our hearts and Mother Earth. Today let us choose to be ONE, let us all choose to be whole. Now, again facing the East direction we look to the future. Collectively, we call on the power of the Sun to bring forth New Life on Mother Earth, we call forth the New World of Life, Unity, Equality for Eternity, manifesting Peace on Earth. As we face East, we look for the New Peace Sun Rising on the Horizon.